Every camp director approaches the beginning of summer with many emotions. Concern that the summer will be safe and fulfilling for campers and staff, anticipation of the moments that create camp community, and even a hope for great campfire weather! Opening Day: Favorite part of the summer is greeting campers. Sock wrestling is Camp JORI’s signature evening activity on the second night of camp. So popular, we repeat it each session and it is the subject of many skits, jokes, and competitive conversations around camp. So popular, that one camper invited Bob, our program director to run a sock wrestling 10th birthday party! Which, of course, he did complete with his super Bob cape! 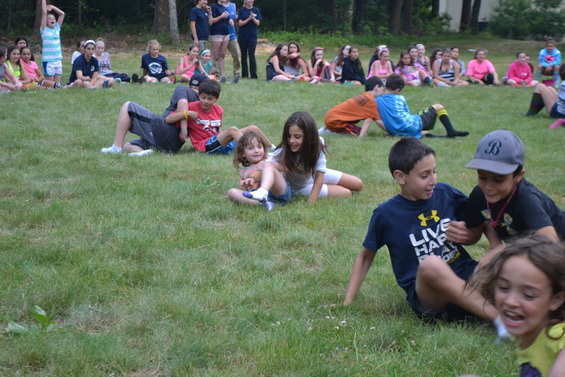 The entire camp sits in a giant circle around the edges of the soccer field while campers and staff link arms when their group is called and try to remove one another’s socks while seated! I did sock wrestle with Ben last summer. I still think about it and smile all day long. Ben won, but his socks were longer! As Ben prepares to go to Israel and become a CIT at Camp JORI in the summer of 2014, I took the opportunity to ask him about his Leader in Training (LIT) summer at JORI. Ben with counselor Jamie R on the last day of camp. How long have you been at JORI? This year when I go to Israel will be my 10th summer part of the JORI family. My mom lied about my age the first year so I could get comfortable at camp while my brothers were still there. What was your high moment of your LIT summer? The high moment of my LIT summer had to be a high and a low. It was the last night of my camper experience. Banquet night, we were all dressed up, had loads of activities planned, and I was looking back at my 9 years, eyes full of tears, appreciating the friends I made who aren’t really friends, really my family. 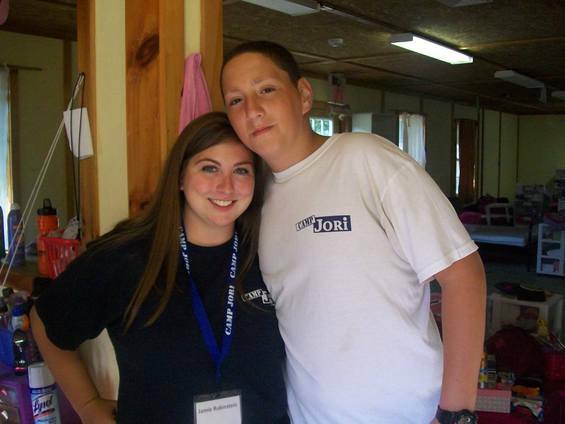 What are the first 3 words that come to mind when you think of Camp JORI? What is special specifically about being an LIT? So many things…working with younger kids, being a “big brother”, leading activities, late night chats and games, really getting to know my counselors, field trips, even waiting tables. How has the camp experience changed you? What is different about you because of Camp JORI? Camp JORI has changed my life in so many ways. I learned how to sail, one of my new favorite hobbies. Most importantly, I have made a new family. Family that accepts me as I am and who I drive hours to see. Not a lie, I do not feel as comfortable and open and care-free at school or at home as I do with my LIT’S. Something that is different about me is I feel I always have someone to talk to if I need it, not my home friends not my family but my JORI family. Why do you think other kids should come to camp? I think other kids should go to camp because it’s a life changer. If you go to camp, you, too, will get to experience the love of 200 or more people at the same time! It doesn’t happen that way anyplace else. What else would you like the entire world and especially the people who read this blog to know? That Camp JORI is the best out there and will be a part of me until the day I die.